Liverpool manager Brendan Rodgers expects players to leave before the end of the transfer window on 1 September. 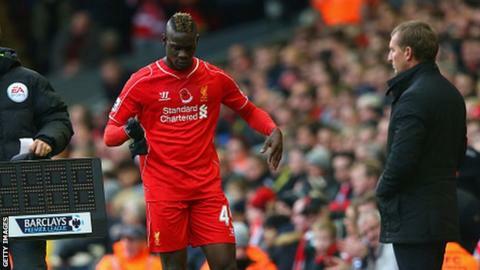 Midfielder Lucas Leiva, defender Jose Enrique and strikers Fabio Borini and Mario Balotelli were all left out for Liverpool's 1-0 win at Stoke. And Rodgers, 42, has told defender Alberto Moreno and winger Lazar Markovic to earn their place. "It is natural at this stage of the season there will be moves for some players," said the Northern Irishman. "What is clear is that every player is understanding of exactly where he stands in the squad," he added. Enrique has told Spanish paper Marca that he, Borini and Balotelli have been "alienated". Liverpool signed Moreno and Markovic last summer for £12 million and £20 million respectively. "Both players are very talented players," he added. "They know very well, with the conversations we have had, it is a long, tough season and they will be needed and when the opportunity comes you take that and keep yourself in the team."